Marmaduke Duck and the Marmalade Jam by Juliette MacIver and illustrated by Sarah Davis was one of the finalists in this year’s New Zealand Post Children’s Book Awards and was one of my favourites. The bouncy, rhyming text and stunning illustrations were a winning combination and made a fun, if tongue-twisting, read-aloud. 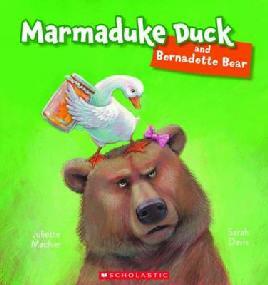 I was excited to see that they had written another Marmaduke Duck book, called Marmaduke Duck and Bernadette Bear. Marmaduke Duck has opened a marmalade shop and animals of all shapes and sizes are coming from all over to sample Marmaduke Duck’s marmalade jam. But then one day, Bernadette Bear shows up and opens a honey shop right next door. Will Marmaduke’s marmalade shop survive or will Bernadette put him out of business? I absolutely love Marmaduke Duck and Bernadette Bear! Juliette’s rhyming text is a joy to read and makes the story bounce along. I’m a huge fan of Sarah Davis‘ illustrations, whether it’s people or the myriad of different animals that populate the pages of Marmaduke Duck and Bernadette Bear. Sarah has the amazing gift of being able to portray animals that look life-like while at the same time having human expressions (just have a look at the front cover to see what I mean). Every page glows with the brightly coloured animals and their crazy antics. Any parent who chooses to read the Marmaduke Duck books to their children is sure to give them a love a words and beautiful illustrations. This is definitely one of my top picture books of 2011. Gecko Press have been keeping up their tradition of producing English language versions of curiously good books from around the world. Here are three of the best recent releases. The Noisy Book by Soledad Bravi is a board book filled with bright, bold illustrations and lots and lots of noises (over 100 pages). There are noises you would expect to find, like ‘The cat goes meow,’ ‘The horse goes neigh,’ and ‘The rooster goes cockadoodle doo.’ But what I like most are the noises you don’t expect, like ‘The cold goes aachoo,’ ‘Mummy goes kiss kiss,’ and ‘The power socket goes NO!’ This is the perfect book to share with babies and toddlers because everyone can enjoy making the noises. The Fierce Little Woman and the Wicked Pirate is a newly illustrated edition of one of Joy Cowley’s most loved picture books. I loved this book as soon as I set my eyes on it! Sarah Davis’ illustrations are absolutely stunning and she has captured Joy Cowley’s characters perfectly. Thank you Gecko Press for giving this wonderful story new life. H.O.U.S.E (or Habitable, Objects, Unique, Spatial, Extraordinary) by Aleksandra Machowiak and Daniel Mizielinski is a fascinating book about contemporary architecture for kids. It’s a book for all those children (and adults) who are fascinated with buildings of all shapes and sizes. Inside, you’ll find spiky houses, inflatable houses, houses in trees and houses underground, from all over the world. The authors explain the inspiration behind the design of each house, as well as the materials used to build it, and where in the world it can be found. These are just three of the latest and greatest books from Gecko Press. I’m sure we can look forward to more curiously good books from Gecko Press next year.